A tasty main dish for company! 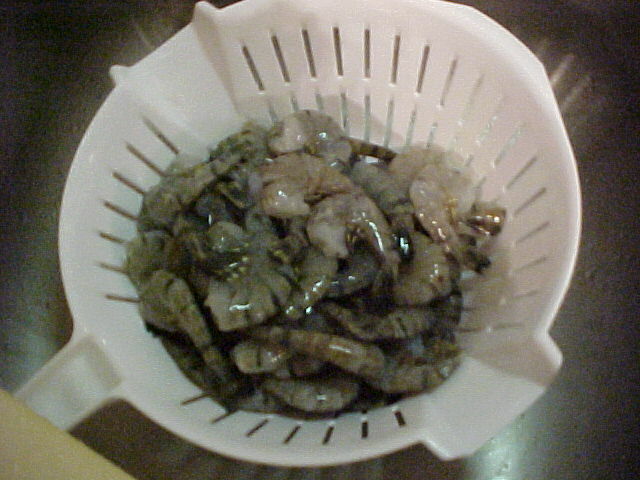 Here are 1-1/2 pounds of fresh, unpeeled shrimp. 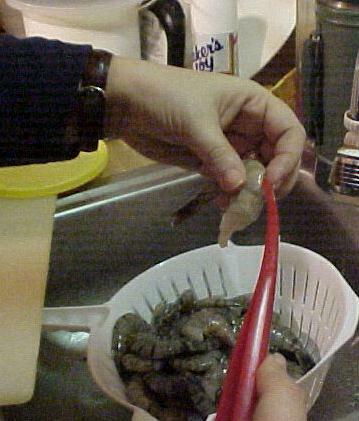 Of course, you can always buy peeled shrimp, but expect to pay a bit more. I really do not recommend buying pre-cooked shrimp. Buy uncooked ones and cook them yourself for a fresher taste. 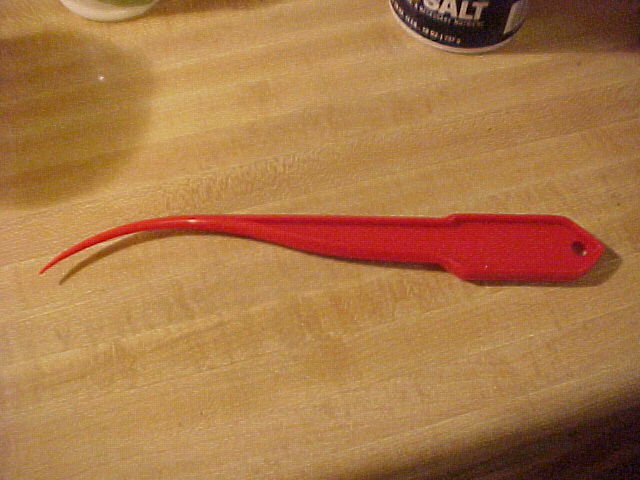 Peeling a shrimp with the shrimp tool. 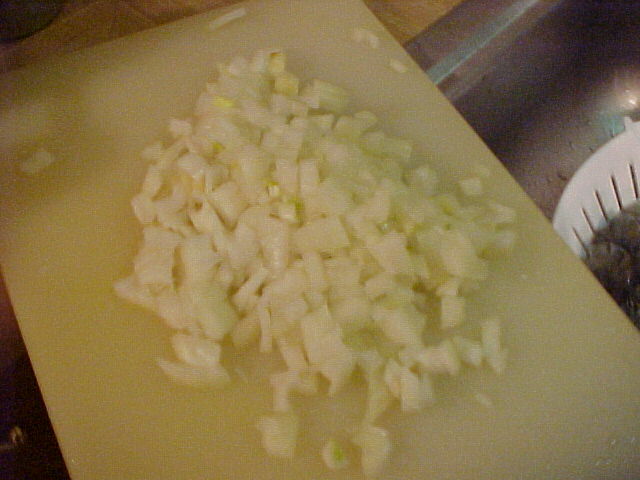 Chop your onion -- remember the easy way is to make cuts across the top in both directions and then slice across the cuts. 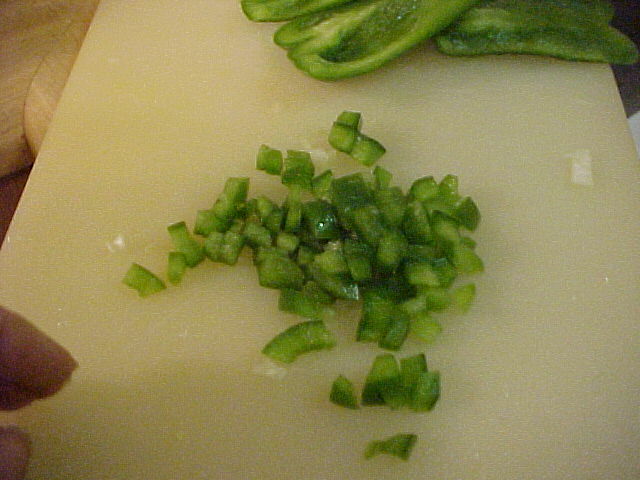 Chop green bell pepper by cutting it into thin strips. 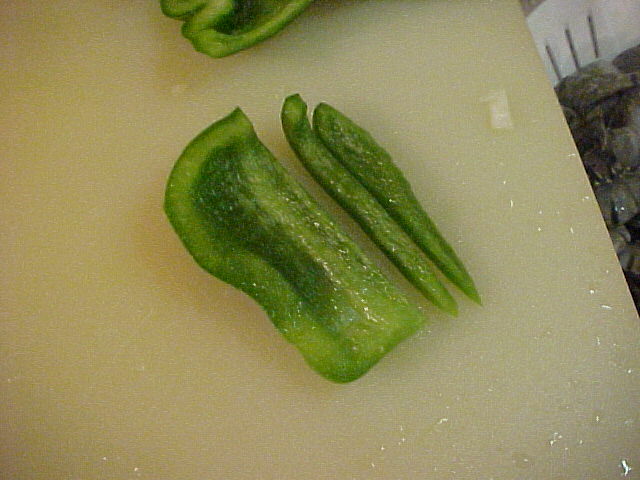 Once you've cut your green pepper into strips, bundle the strips together and slice across them. 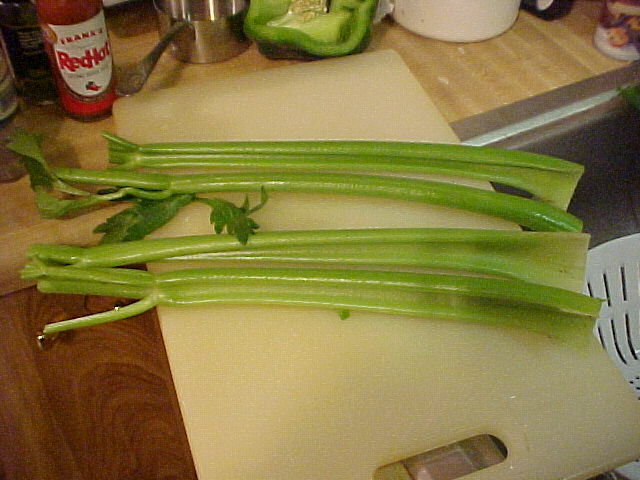 Clean 4 nice stalks of celery. 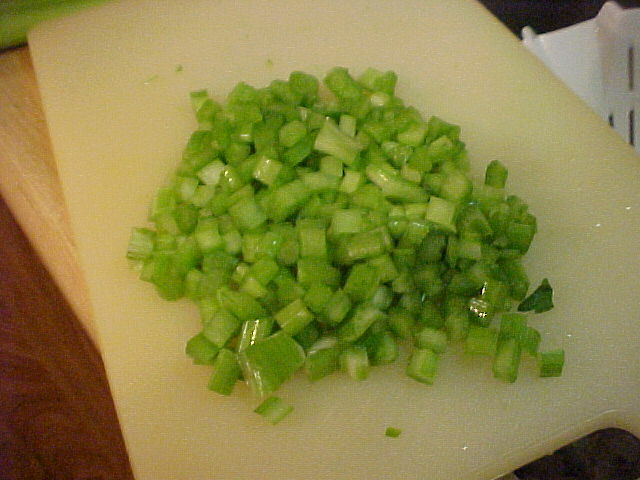 As with the green bell pepper, you will cut your celery into thin strips, bundle them up and slice across to dice your celery uniformly and efficiently. Remember, these neatly diced vegetables will be a large part of your sauce -- you'll be serving them to your guests and you'll want your dish to be attractive. My motto: PRETTY FOOD TASTES BETTER! 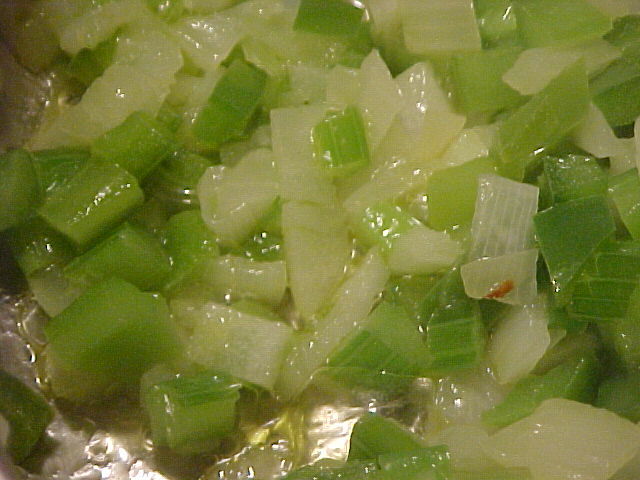 Saute your diced onion, green bell pepper and celery in 4 Tbs. 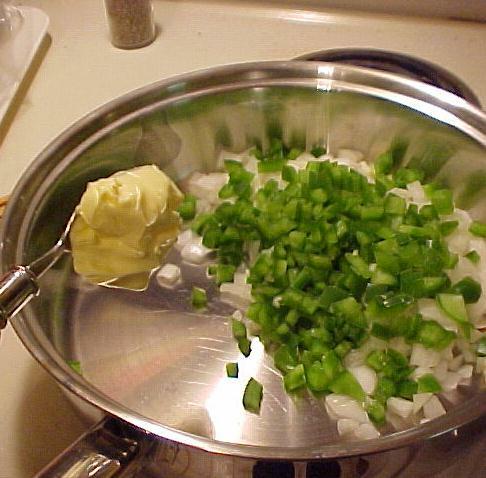 of butter or margarine in a large frying pan. 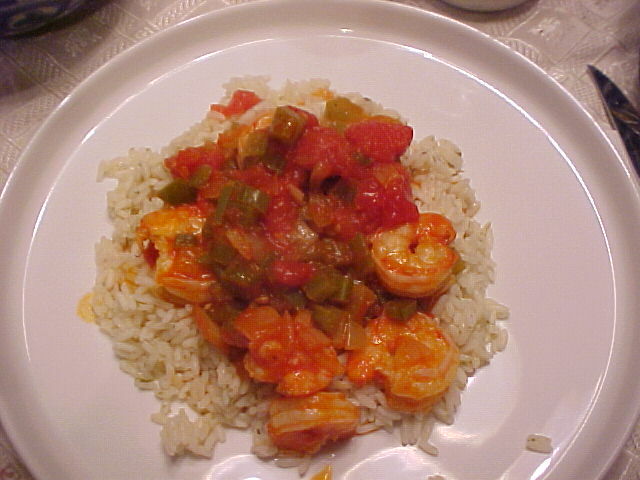 While the vegetables are being sauted, cook the shrimp by immersing them in a pot of rapidly boiling salted water. 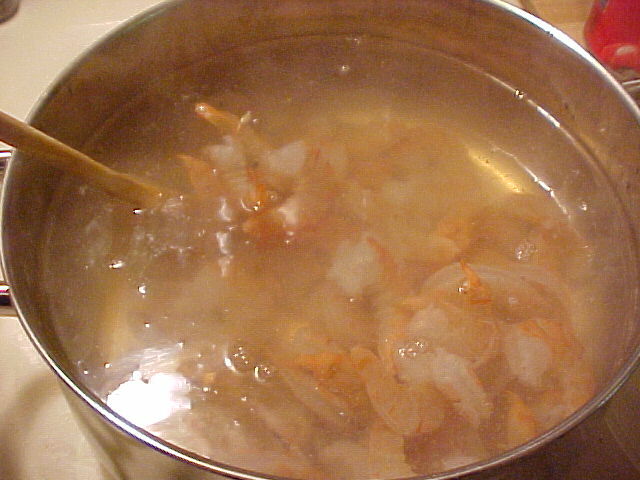 The shrimp will become pink and start cooking immediately. 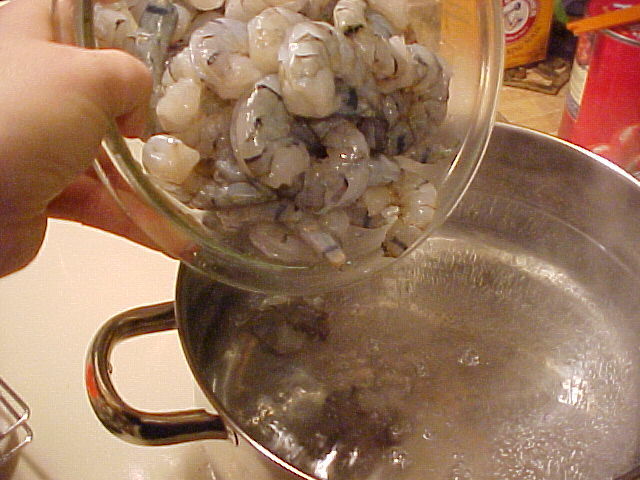 Stir several times and let them boil about 5 minutes. Drain and set aside. Caution: do not allow family members into the kitchen. 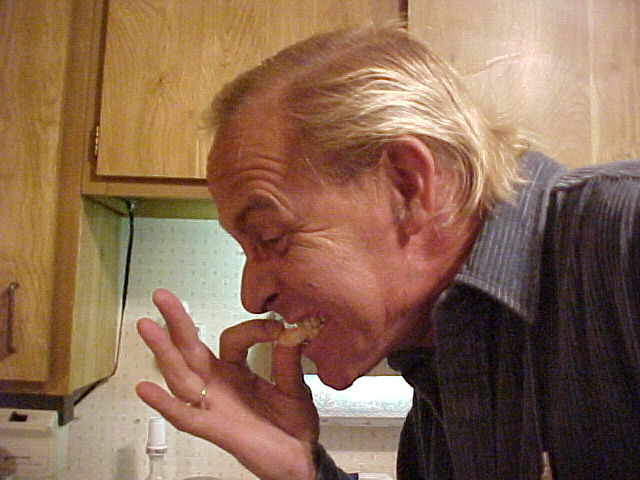 The lure of freshly cooked shrimp may be too much to resist for the weaker members of your family. Continue stirring the vegetables as they saute'. 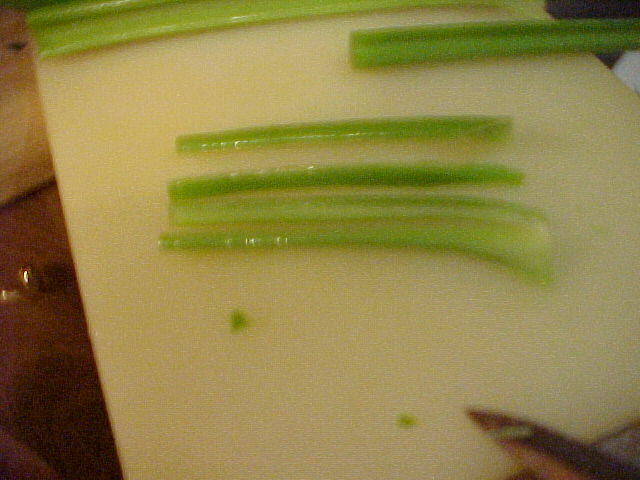 You'll be ready to go to the next step when they are somewhat tender and the onions begin to be translucent. 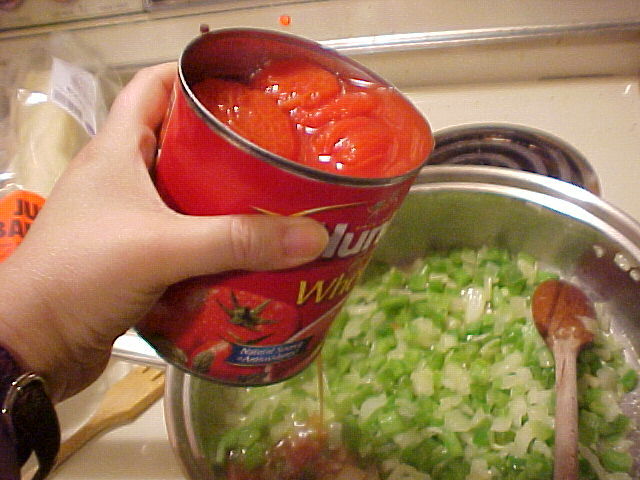 Add the can of whole tomatoes. 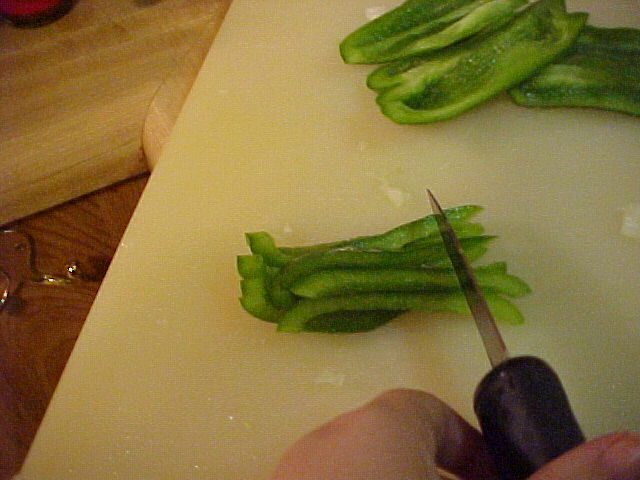 Cut the larger pieces of tomato up with a sharp knife so that you have smaller, more bite-sized pieces. Season with salt, pepper and Mrs. 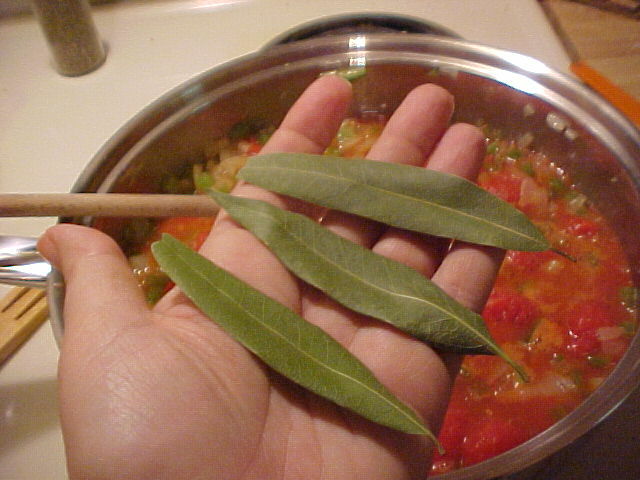 Dash (if preferred) and then add 3-4 nice bay leaves to your sauce. 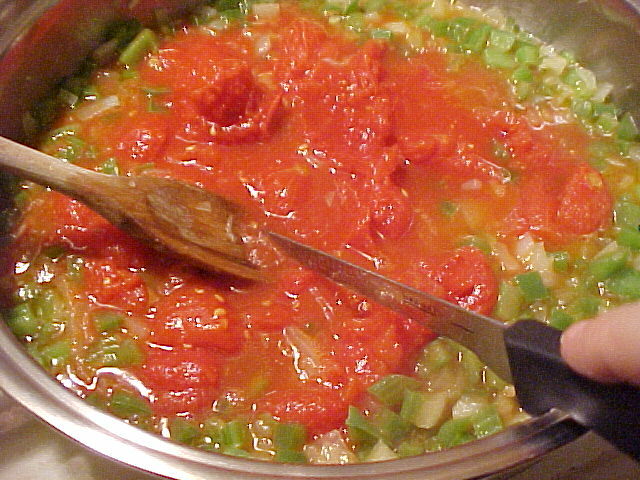 Let simmer for 20-25 minutes. 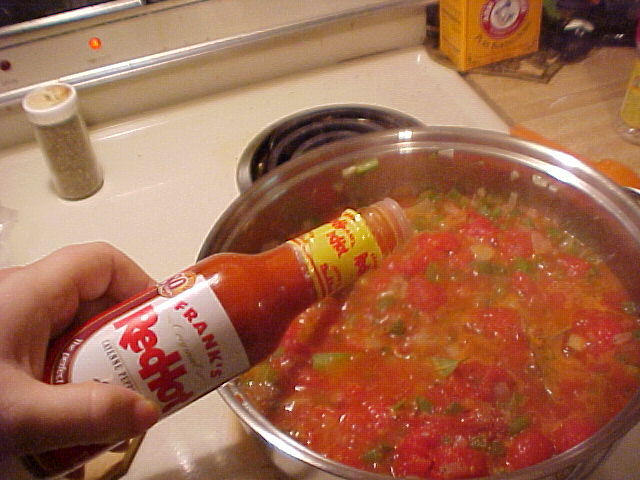 Add Tabasco Sauce to your taste -- you can start with about a teaspoon but stir the sauce and taste it as you add it to make sure it is to your own specifications. 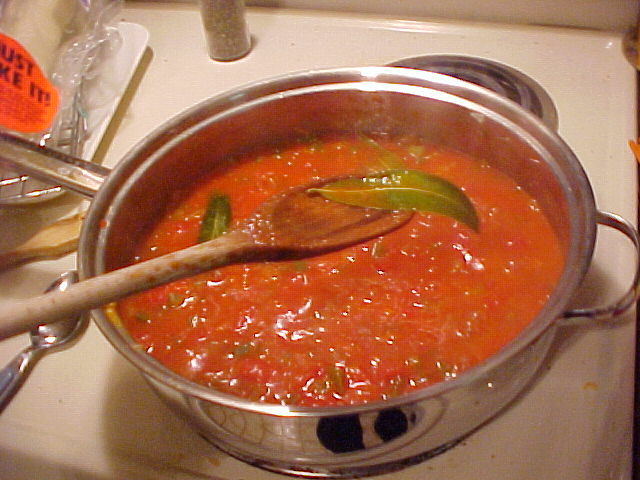 After simmering the sauce for 20-25 minutes, remove the bay leaves and add the cooked shrimp. 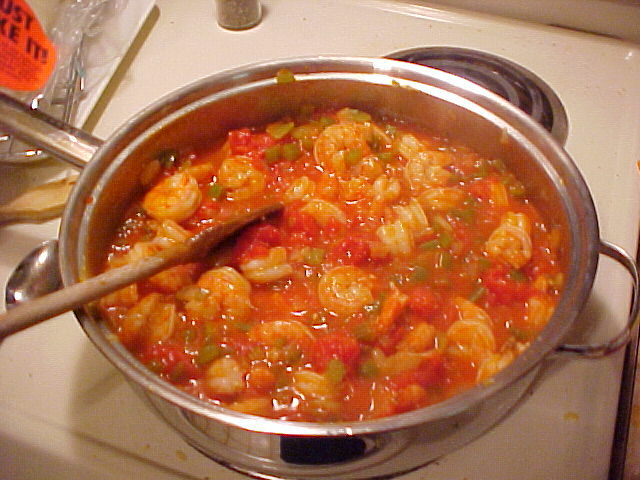 Stir in the shrimp and let the sauce and shrimp simmer for 5 more minutes. Serve over rice.